Apple Pay is becoming much more useful in Canada, as the mobile payment system welcomes the partnership of the country's five biggest banks. Apple Pay is becoming much more useful in Canada, as the mobile payment system welcomes the partnership of all five major banks. The mobile payment system allows customers to upload credit and debit card information to their smartphones and use it at stores and restaurants to make purchases of up to $100. Royal Bank and CIBC customers, as well as holders of Canadian Tire Bank and ATB Financial MasterCards, were able to use Apple Pay as of Tuesday. TD Bank says it will be making the service available for Interac and Visa cards in the coming weeks. The Bank of Montreal and Scotiabank have indicated they will roll out Apple Pay in the coming months. The system launched in the U.S. in 2014 and in Canada late last year, but hasn't had much pickup because the big banks had been reluctant to sign up. Apple Pay used to only work with non-bank American Express cards, which are rare in Canada. The company took that tack specifically because Amex is both the card issuer and payment processor, and thus easier to co-ordinate. Visa and MasterCard typically offer cards tied to financial institutions. Apple Pay is available with the various iPhone 6 iterations and iPhone SE in compatible apps and stores. Apple Watch (paired with iPhone 5 or later) works in stores, and four different iPads (Pro, Air 2, mini 4, mini 3) work in apps only. Processing payments firm Moneris said in a statement that twenty-five per cent of its transactions are through contactless cards or devices — a number that has doubled year over year. "With the support of two of the largest banks in Canada, BMO Financial Group and Royal Bank of Canada (RBC), consumer adoption of Apple Pay is expected to increase significantly," the statement said. "Many of Moneris's largest customers, including McDonald's Restaurants of Canada Limited, are 100 per cent contactless enabled and ready to accept Apple Pay." London Drugs, Tim Hortons, Canadian Tire, Petro-Canada, and Pizza Hut are among the stores ready for Apple Pay, according to Apple's website. Among the places where Apple Pay is "coming soon" include Air Canada, Pizza Pizza and the Toronto Transit Commission. Apps that accept Apple Pay include Delta, Groupon, Kickstarter, Ticketmaster and Starbucks. Businesses that accept Apple Pay can also receive "added visibility" on Apple's map app. Neil Bearse, director of marketing at Queen's University's Smith School of Business, said the roll-out has been "less magical and revolutionary" than Apple had once promised. 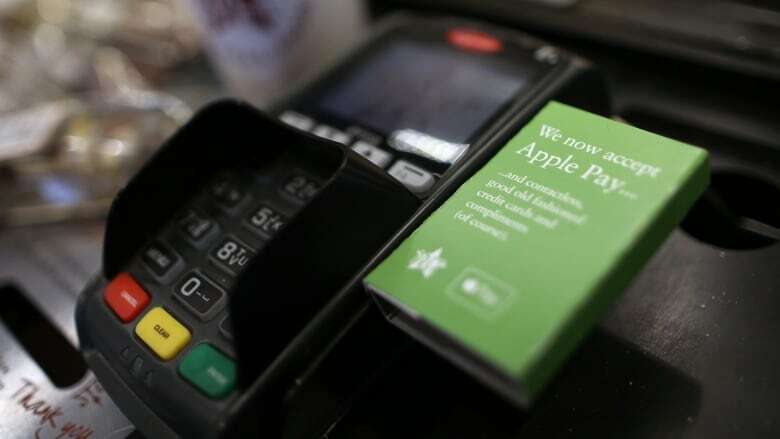 "The issue is that when you go to a gas station or a convenience store and it doesn't work or the person behind the cash register doesn't even know what Apple Pay is, that's when you run into hurdles," he said. "When you're trying to disrupt something that's as much of a habit as reaching for your actual physical wallet and paying with a plastic credit card, you need to be sure that your users are going to be confident enough that it's going to work." That said, he thinks it has the potential to succeed, allowing many people to leave their wallets at home and using a phone that is harder to steal from than a typical debit or credit card. "If it catches on, it is a leap forward in terms of making payment both easier and more secure." The technology works in a way that should allow people to use Apple Pay and competitors Samsung Pay or Google Wallet anywhere where tap is available, Bearse said. Avinash Chidambaram, vice-president of product and platform development at Interac, says he expects Canadians to embrace the technology quickly and readily. When Apple Pay launched in the United States, contactless payments were a new phenomenon for shoppers, and it took some time for them to adjust their payment habits. Canadians, on the other hand, are already used to paying with a tap because the technology was introduced into credit and debit cards some time ago, Chidambaram says. "[In Canada] you can find contactless flash terminals at virtually any merchant that you want to shop at," says Chidambaram.